In 2016, MBDC partnered with L’Oréal to assess and optimize Biolage R.A.W. Nourish Shampoo and Conditioner to help them achieve Cradle to Cradle Certification. The Nourish Shampoo, made from quinoa husk and honey, is of 77% natural-origin (i.e. unchanged from the original plant or mineral source), and Nourish Conditioner, made of coconut oil and kaolin clay, is of 95% natural-origin. The shampoo and conditioner are both 99% biodegradable and do not include silicones, parabens or artificial colorants. MBDC first engaged the supply chain to obtain and assess full product formulations down to the molecule. Team members visited L’Oréal’s manufacturing facilities and audited all processes using Cradle to Cradle criteria. We inventoried energy usage associated with production of Biolage R.A.W. products and facilitated purchase of Renewable Energy Credits (RECs). We also mapped water flows and evaluated the water effluent at production facilities, and performed a social fairness screen of tier one suppliers. Throughout the process, MBDC recommended opportunities for improvement in all categories evaluated. 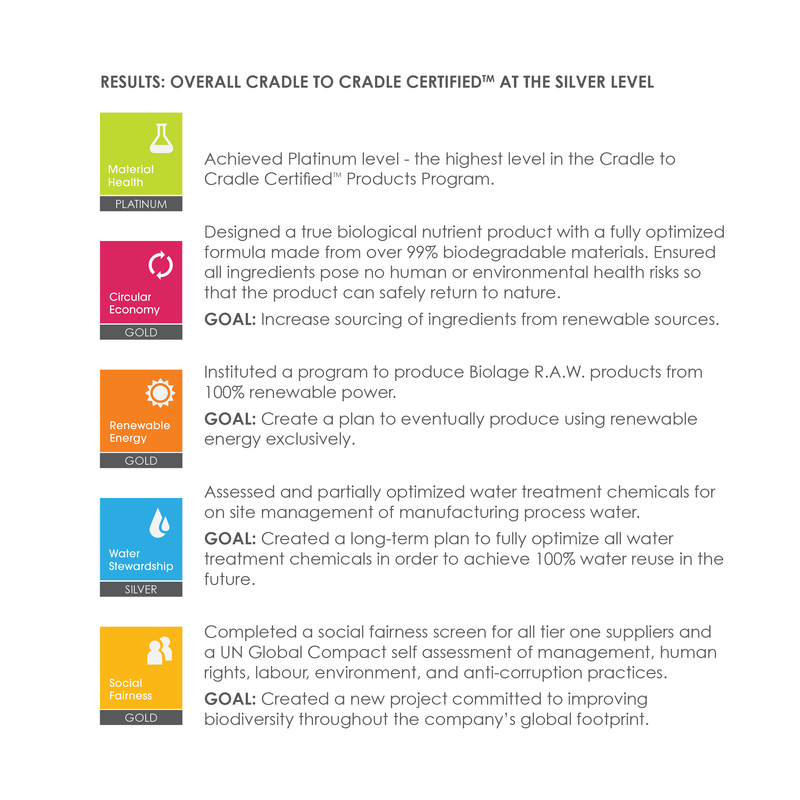 Sustainable Brands | L’Oréal USA Announces Cradle to Cradle Certifications for Biolage R.A.W. 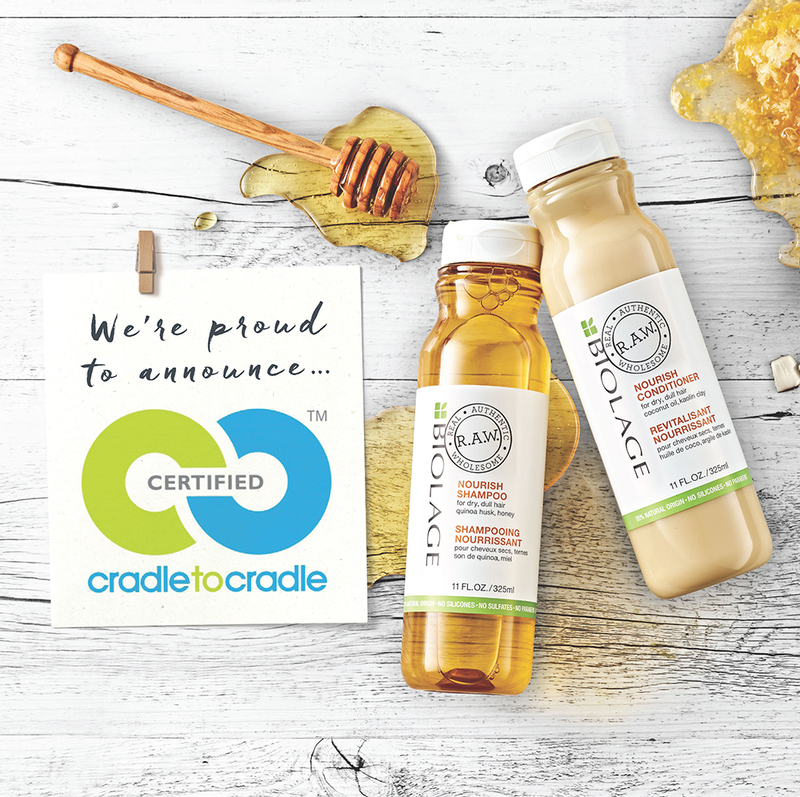 American Salon | L’Oréal USA Announces Cradle to Cradle Certifications for Biolage R.A.W. Cosmetics Design.com | L’Oréal USA Announces Cradle to Cradle Certifications for Biolage R.A.W. Cosmetics Business | L’Oréal Receives Cradle to Cradle Sustainability Certification for Biolage R.A.W.